Here is a recipe that totally won me over. It is a cheaters way of filling pasta by using egg roll wrappers instead of boiled noodles. I was a little leery of trying it but since filled pasta is such a pain, I thought I would give it a try. Just an experiment…. Little did I know that I would love it! So here it is for you to try. Egg roll wrappers are made of flour, water and eggs just like fresh pasta. 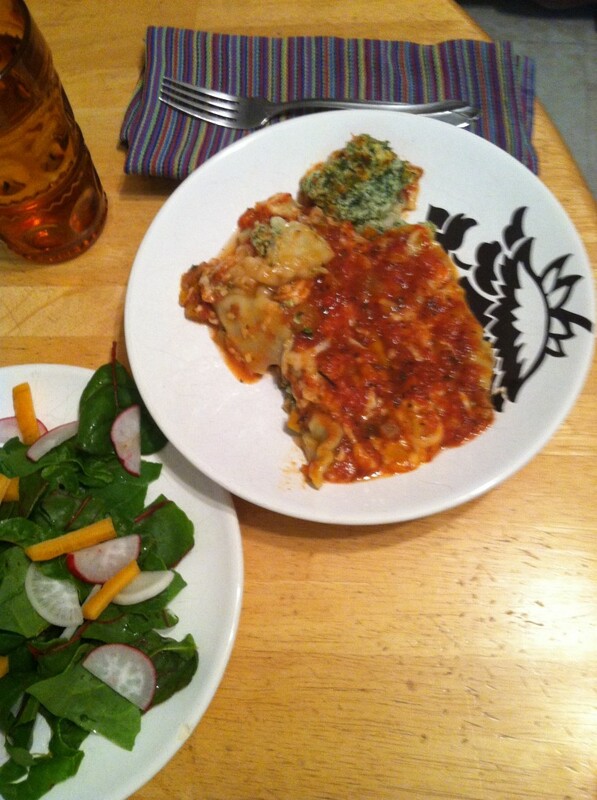 If a grocery near you sells fresh sheets of pasta, like lasagna noodles, you can use those instead. I tried two different ways of rolling them, either pinching the ends or tucked in burrito style, both worked just great. As usual with a pasta dish, a nice green salad and garlic bread are needed for full on gastronomic delight. I found this in Recipes from the Root Cellar by Andrea Chesman, a true genius of a cook. Bring a large pot of salted water to a boil. Add the kale and blanch until wilted and bright green, about 3 minutes. Drain and plunge into a bowl of ice water to stop the cooking. Drain again, squeezing out the excess liquid. To make the filling, finely chop the garlic and shallot in a food processor. Add the kale, ricotta, Parmesan, eggs, and nutmeg, and season with salt and pepper. Pulse until very finely chopped. 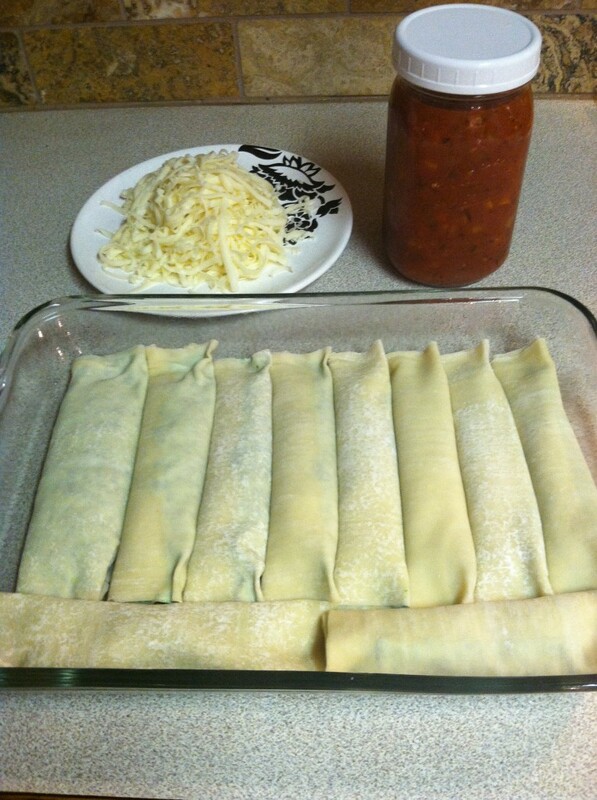 To assemble the dish, mound a scant 1/2 cup of the filling evenly along one side of each egg roll wrapper. (She really does mean scant 1/2 cup; it was more like 1/3 of a cup for me.) Roll each wrapper to enclose the filling. Set the rolled cannelloni, seam down and slightly apart, in the prepared roasting pan. (As you can see from the above picture, I set them right next to each other. Less dishes to wash for me!) Cover the cannelloni with the mozzarella cheese. Spoon the sauce over and around the cannelloni. 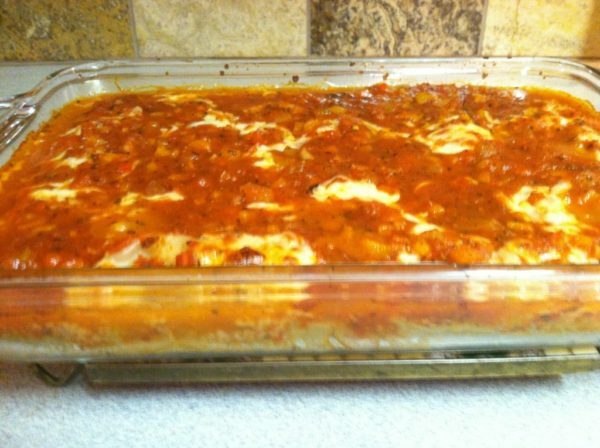 Bake, uncovered, for 20 to 25 minutes, until the sauce bubbles, the cannelloni are hot in the center, and the wrappers are tender. Serve Hot.